What part does Molex play in the Cloud? A Preview of OFC/NFOEC 2012. As I’m writing this, somewhere in the world someone has just downloaded the 25 billionth app from the Apple web site. We live in an age where it seems there is an app for everything, including a mobile app for the upcoming OFC/NFOEC show that I’ll attend March 6th through 8th in Los Angeles, CA. This year’s show promises to be a good one. Apps are just one example of the software and media downloaded from “the cloud” – an entire ecosystem of networked equipment that the world collectively has been building for several years, yes the Internet, aka the Web. At the heart of the cloud are enormous data centers and High Performance Computers (HPCs) with racks and racks of the latest networking and computing equipment from vendors throughout the world. Molex is proud to be a key supplier to many of the vendors that supply cloud equipment – blade servers, routers, switches, etc. – and we’re well positioned in the industry with our electrical and passive optical connectors. It would be hard to find a single piece of gear in the cloud that doesn’t have a Molex component. But our active optical capability is an exciting new chapter for us. Since early 2011, Molex has been shipping active optical cables (AOCs) to data centers and HPC installations the world over, supplying hundreds and even thousands of these cables to single site. An AOC is a fiber cable with built-in active electronics and an embedded transceiver at both ends of a ribbon fiber cable that provides E-O-E (Electrical-Optical-Electrical) conversion. There are many high profile (as well as private) installations that use Molex 40 Gbps QSFP+ AOCs. Earlier this year, we started shipping our latest QSFP+ AOCs – achieving overall bandwidth of 56 Gbps in a single cable (four channels at 14 Gbps each). We will demonstrate the 56 Gbps AOC in partnership with Vitesse at OFC/NFOEC (Corporate Village Room 2157 ). Each time an app, MP3, movie, or YouTube video is downloaded, Molex products are being used to connect various pieces of the cloud (socket-to-socket, board-to-board, rack-to-rack, and room-to-room). As bandwidth increases, more and more of these connections will use optics for high bandwidth interconnects. In particular, AOCs have been most widely deployed in InfiniBand (a connection protocol with extremely low latency) HPC installations at QDR or 10 Gbps/channel. In data centers today, the predominant single channel connection data rate (or lowest port speed) for Ethernet equipment is quickly transitioning to 10 Gbps per port. Ethernet equipment uplink data rates also need to increase to accommodate the 10 Gbps port speeds. As a result, 40 Gigabit Ethernet and 100 Gigabit Ethernet are now seeing more widespread deployment and we are seeing these interconnects incorporate more AOCs. As speeds increase, we will see even more AOCs deployed and fewer copper cables with their distance constraints. In addition to AOCs, we are also seeing a renewed interest in on-board optics and optical backplanes. Molex also has some exciting upcoming products for on-board and backplane optical interconnects. Equipment vendors are now designing their next generation platforms. We expect 2013 will see a key milestone for interconnect speeds – both Ethernet and InfiniBand will reach 25 Gbps per channel (or 28 Gbps with overhead). In essence, interconnect speeds of the cloud will more than double in the next couple of years. Molex will be at the forefront of the active optical interconnect challenge. In our second demonstration at this year’s OFC/NFOEC show, we will partner with Altera and Gennum to demonstrate our 28 Gbps active optics. Come to the OIF (Optical Internetworking Forum) booth (Booth 713) to see the demo. 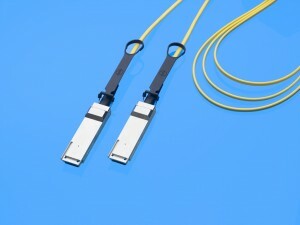 The demonstration will test the 28 Gbps transmission technology over 2km of singlemode fiber utilizing Molex’s silicon photonics-based transceiver and zQSFP+ Interconnect System. The channel will include PRBS31 data at 28.05 Gbps within the Altera FPGA, and then transmit over a Gennum VSR host channel, through a Molex zQSFP+ connector to Gennum clock and data recovery (CDR) integrated circuits. Molex is also developing a series of passive optical backplane interconnects. After all, what good are the active optical products without the surrounding connectors? Molex is uniquely positioned to offer the latest active optical interconnect technology and the end-to-end” connectors that will help our customers build the next generation cloud equipment. I’m looking forward to spending time with customers, colleagues, equipment designers and data center experts to discuss the Molex solutions in the ever-changing bandwidth race to support the cloud. Come see us at booth 2211; we look forward to talking to you.